Drupal 8 came out with many new features and updates at the end of 2015. As Drupal 8 is object oriented and enforces PSR-4 standards, the way you make modules has significantly changed. However, this change makes modules much more organized to fit today’s coding practices. 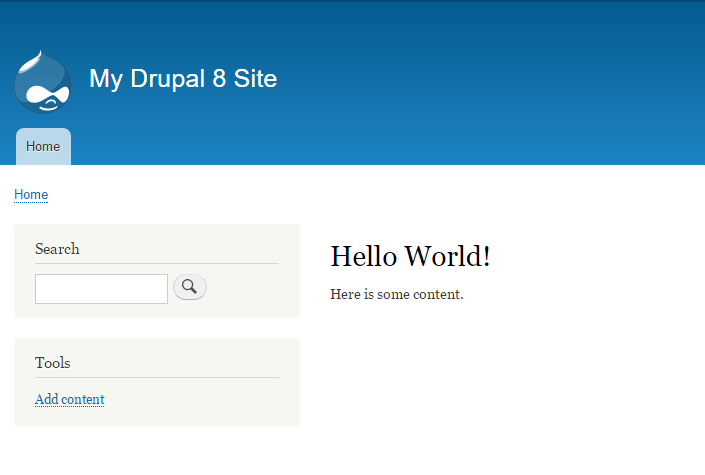 I will be demonstrating how to create a simple “Hello World!” module in Drupal 8. I will be assuming you already have a working Drupal 8 website. 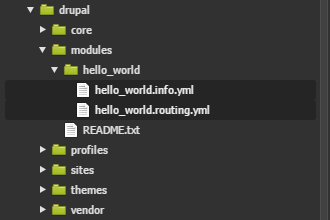 Drupal 8 has a much cleaner folder structure than before. All the modules will go in the module folder. 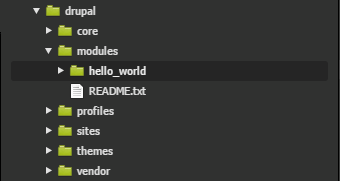 Create a hello_world folder here. This will serve as the machine name for the module and will contain all the necessary files for our module to function. This is the title of our module shown on the extend page. This is to tell Drupal what we are making is a module. This is a description shown alongside the title on the extend page. This is what category our module will be listed under on the extend page. This tells Drupal our module is compatible with Drupal 8.x core. 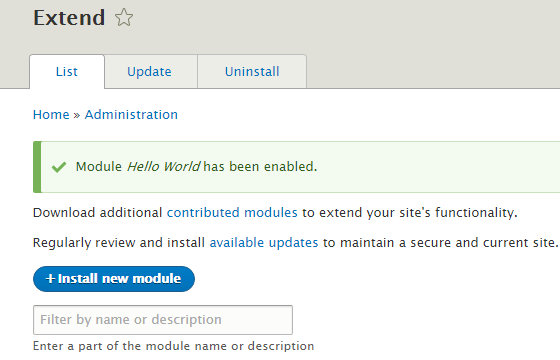 This tells Drupal what path will be used to access our module. 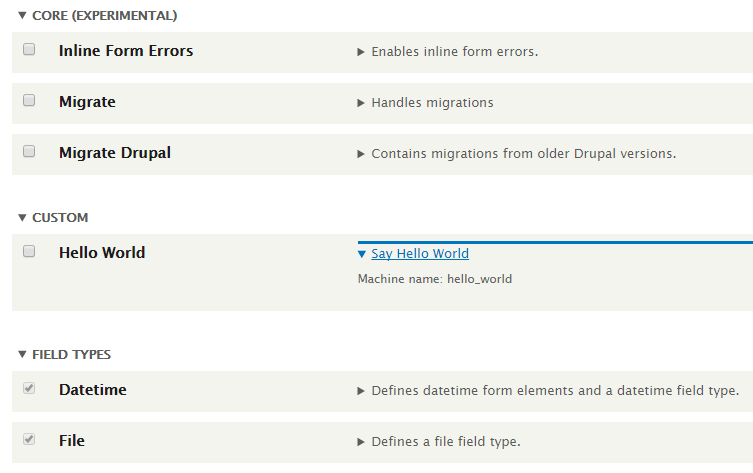 This is the method Drupal will call to process a request to our path. This is to ensure only users who can access content will be able to see our Hello World page. Quotes are not required around the values, however, you can include them to be safe. 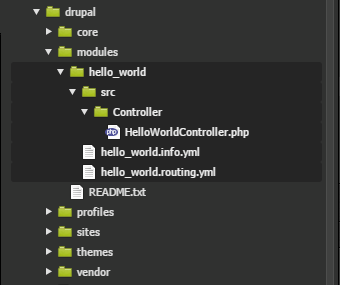 know how to define module parameters and set up your own Controller to handle specific route requests, you can move on to create more complex Drupal modules using other components such as Forms and implementing Services. This is vastly superior to the official documentation, which just tells you to download a git repository. This is brilliantly written by a brilliant person. Great work man. working fine. Was lookin’ to quietly mention the error on line 5, ’til you encountered & corrected the result near the end — that turned your good tutorial into an excellent lesson for all. Beyond encouraging you to continue your efforts, I just wanna add that you’d be an asset to any development team, anywhere. But i wanted normal page with drupal style.